No bloody A, .... oh, sorry. He's poorly dressed. He's poorly dressed. And he's a fake. And he's a fake. That reminds me. We need Senator Vreenak. Ship ability : "It's a FAAAAAAKE!" 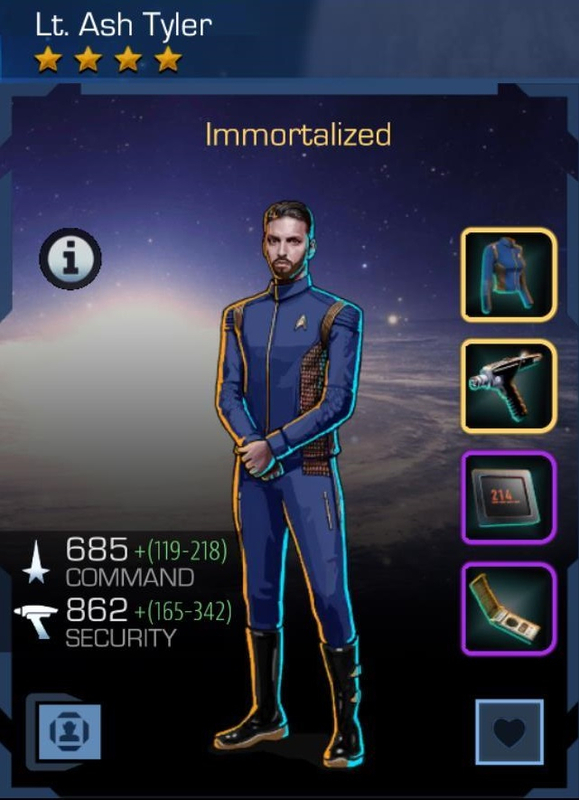 Augmented Riker can't even afford to buy new clothes. Except he wouldn't be a fake. That would be a fake out. And he slides into 3rd place on my SCI list between Princess Jadzia and Ilia. Anyone know why he's standing on his tippy-toes? 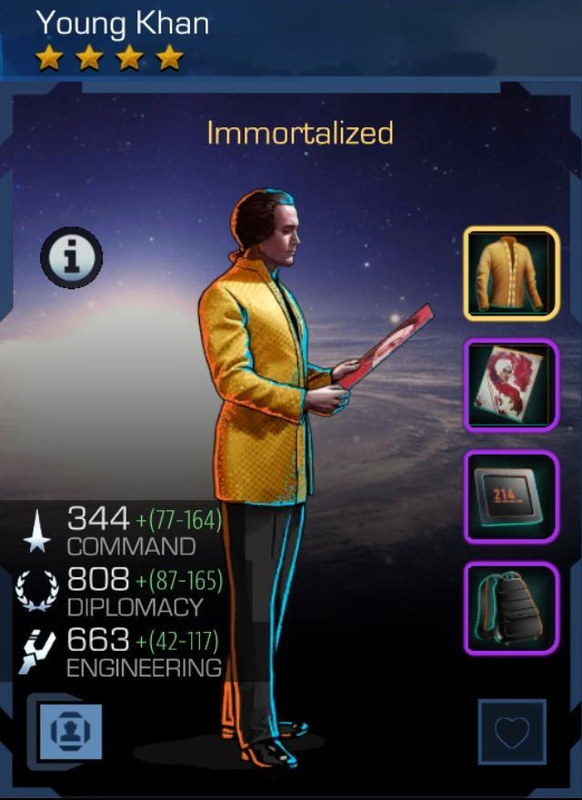 He glides to #3 on my SCI list after 3/5 Laborer Spock and Princess Jadzia. Grats! Ahh the beloved power creep. 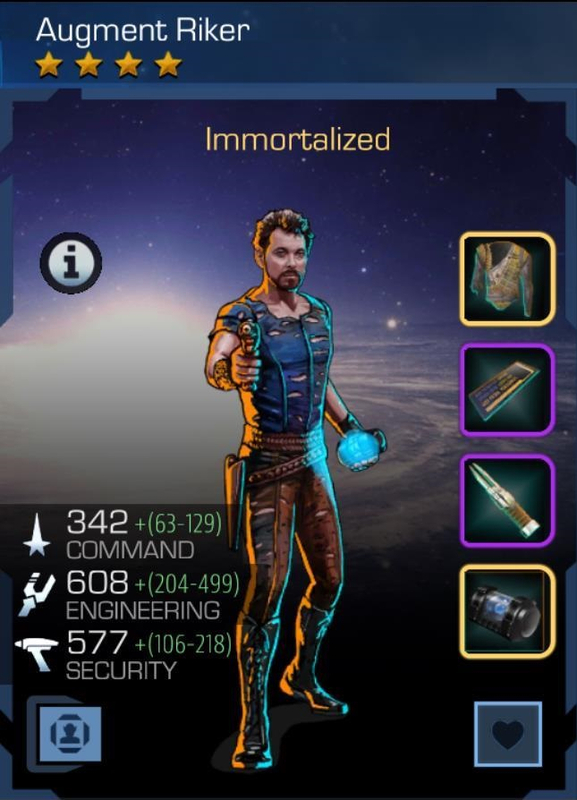 Hes my #3 also, after Princess and 3/5* Commander Dax. Sadly, he's my #1 with #2 being First Officer Saru and #3 being 1701 Jadzia. The latter was my #1 for well over a year. 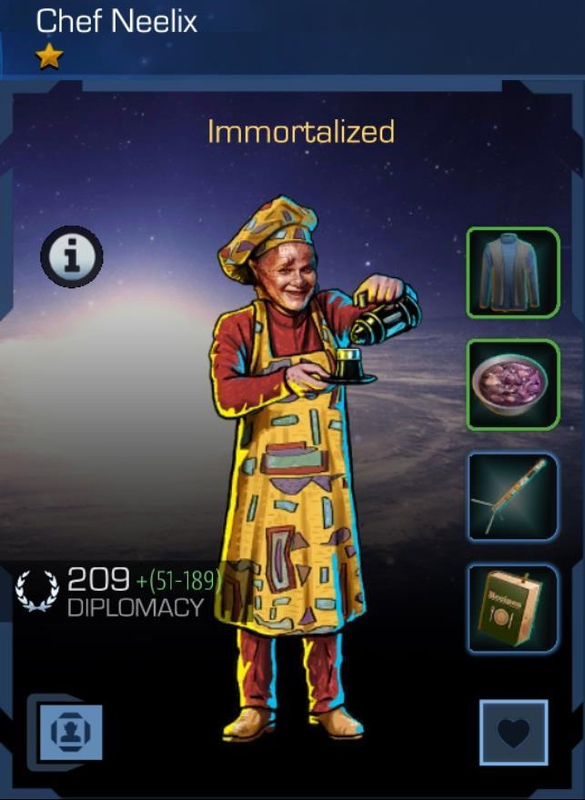 I really need some high end science because I have quite a few epic missions in Episode 7 and Celestial Temple that I'm stuck on. I don't think there's any avoiding the creepy power creep. Sad that the old farts have to be put down - er - frozen solid. I haven't even looked at the high end missions except for the few I've done because of adwarps. 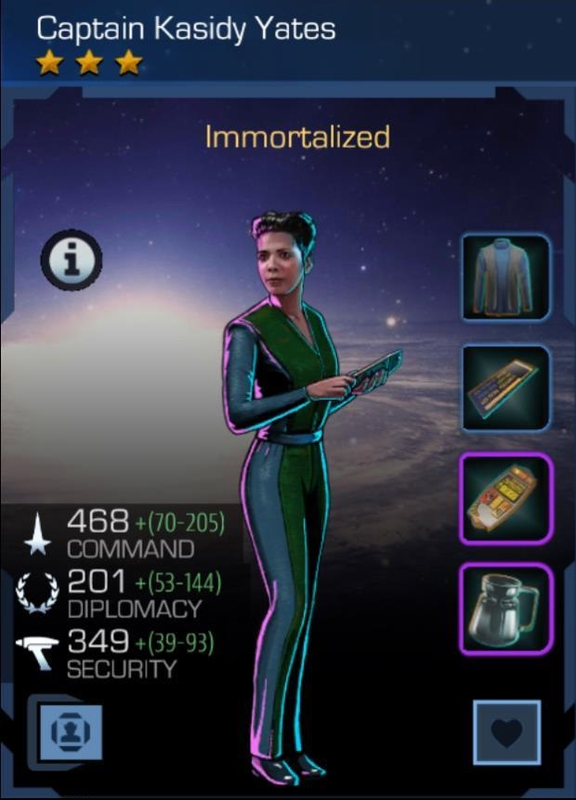 1701 Jadzia was my #1 for a very long time until the event where pajama Dax was threshold and I got her 4th from a pull. 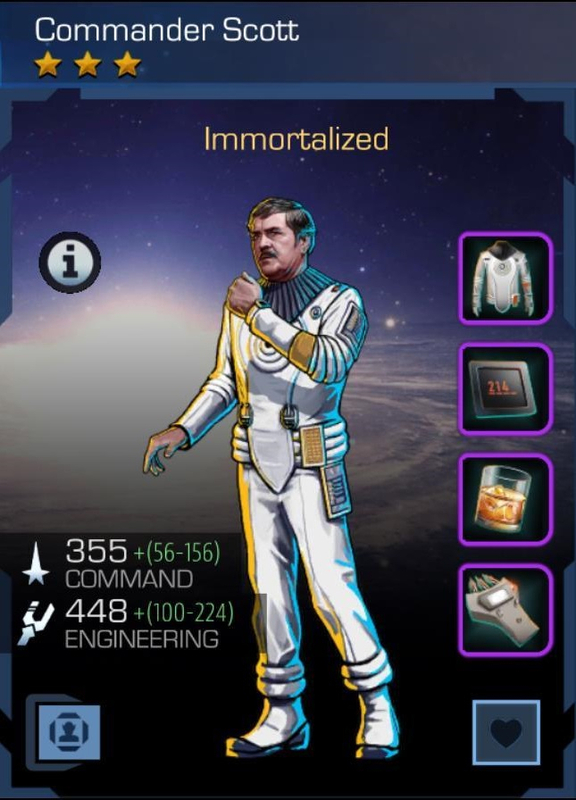 Laborer Spock was just an extremely lucky couple of pulls. I guess if you play this game long enough, you get a few lucky breaks. Too bad there are so many ulnucky ones. I have been waiting like forever for his event to come around again so I could FF him. Then, just like that, my ace crew solved a voyage dilemma at the 6 hour mark and BOOM - Young Khan appeared out of thin air. YAY! To bad the creepy power creep has made him only #8 on my DIP list. Even at 3/4, he had been a powerhouse DIP for me for quite some time, but now it may be time to put him to bed. 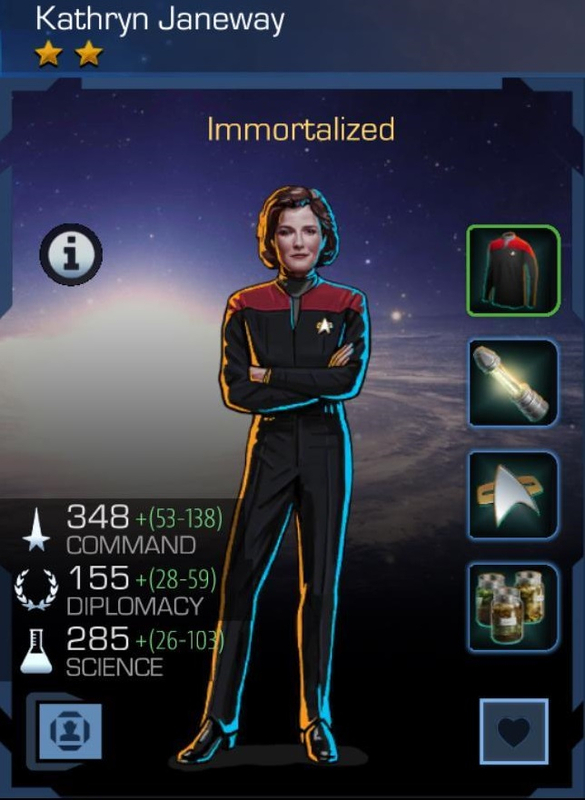 I've been waiting like forever for a second one of her and a voyage came through for me. 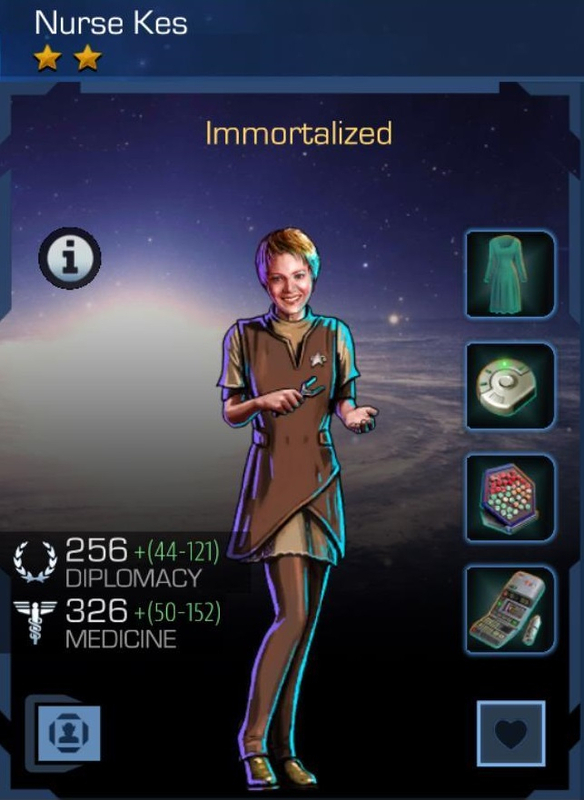 Not really sure if she or Dr Phlox is better for the cadet challenges, but I seem to appreciate Phlox's SCI so I guess it's bye bye for Kes. Bye bye Kes. Never even saw him before he appeared on a voyage. 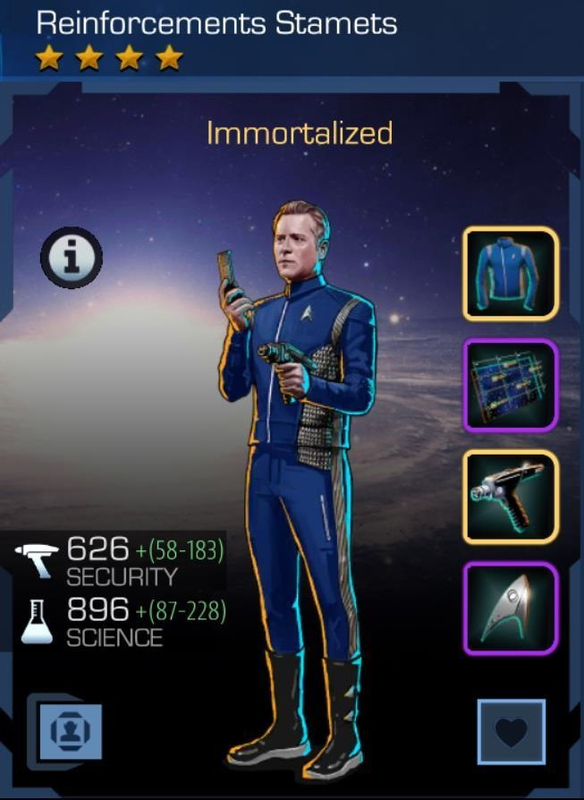 I like that voyages are giving me the few remaining low level crew I still need to add to my collection. 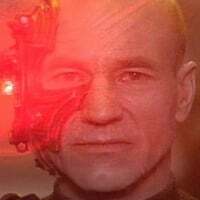 Lt with a period makes it to #6 on my SEC list edging out Assimilated Tuvok. He'll stick around, at least for a little while. Good work on Ash, he was quite chrono intensive to level if I recall, glad I skipped the event after the threshold rewards else I would never have leveled him. I had 2500 chronitons at the event start. It was exactly enough to hit 130k, stop, and then immortalize him. I replicated maybe 3 pieces of equipment (intermediate pieces, not final pieces). 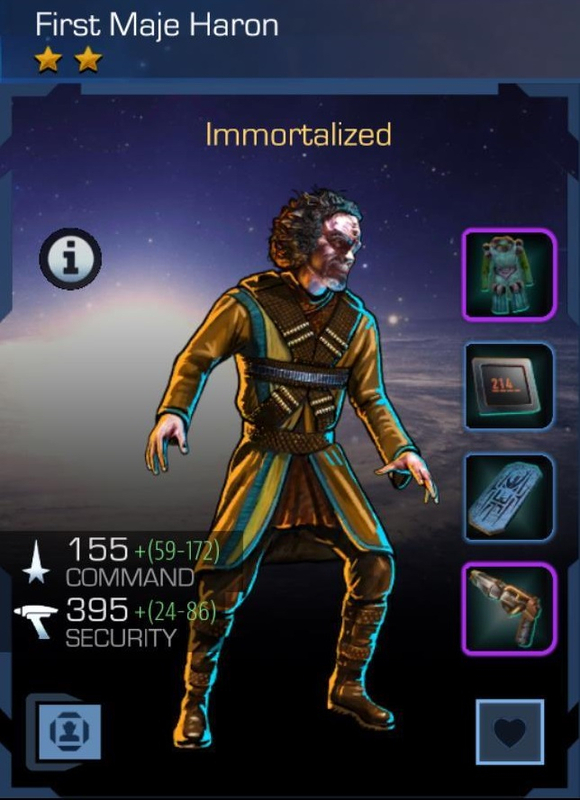 He's 3 on my list though, behind Kortar and Ba'Ku Worf - I lack for high end SEC (and SCI). Projections on who 200 might be? 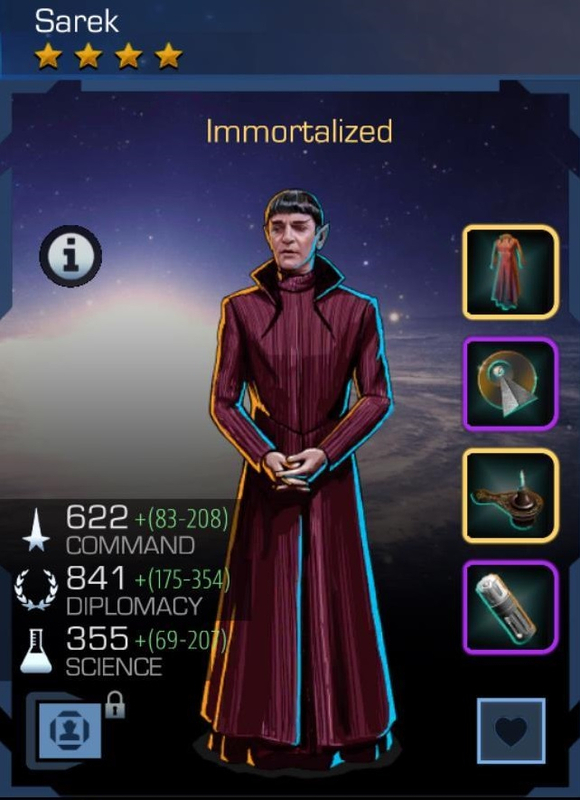 I'm at 198, so depending on how I score in this event, Blood Oath Jadzia will be 199 (she's 1/4/100 right now, almost FE), and then the new Sarek will be 200, depending on if he's 4/4, or 3/4 + 4* citation. 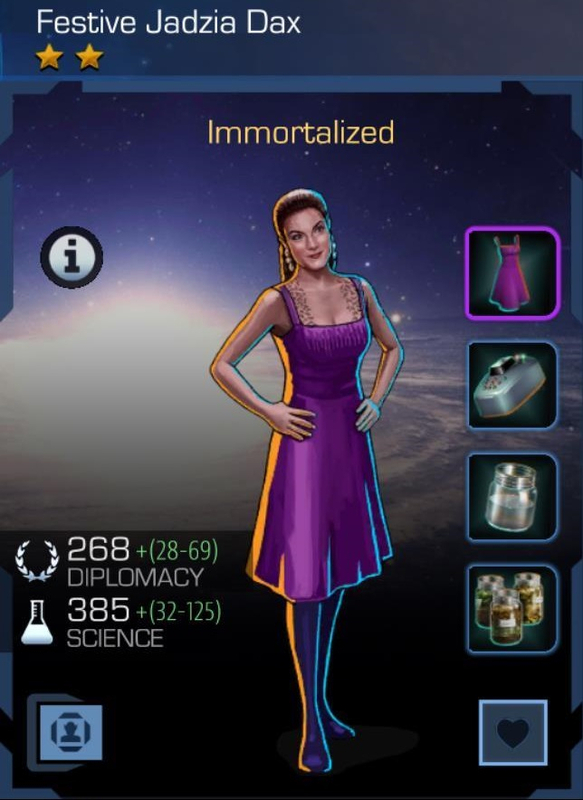 EDIT: Actually looks like new 2* Festive Jadzia will be either 199 or 200 and BO Jadzia will be the other. Problem solved! I keep telling myself to skip events but I keep refusing to listen to myself. Grats on the 200 milestone. Too early for me to tell, but I would like it to be someone special. 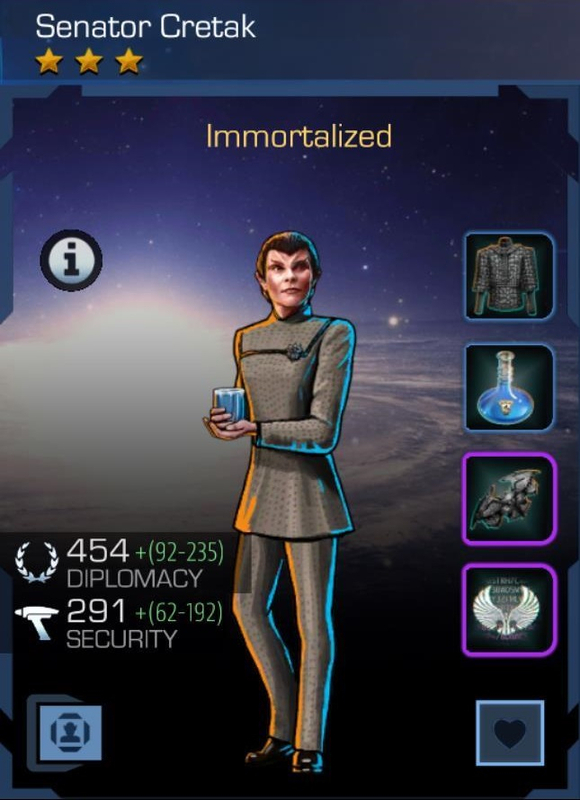 So why isn't he named "Young Sarek"? In any event, he's only #7 on my DIP list so he'll likely only see limited regular duty. Probably good for voyages, though. Looks like she's replacing Melora. How festive. Stupid compression rifles. And his other First Maje buddy, whom I just FFd, needs 30 of them. I should just grab one and shoot them both! Another one that I kept airlocking because I never got all 3 at one time - until recently. And there she goes. I've mentioned before in this thread (old forums) that I started playing at the end of July 2016. 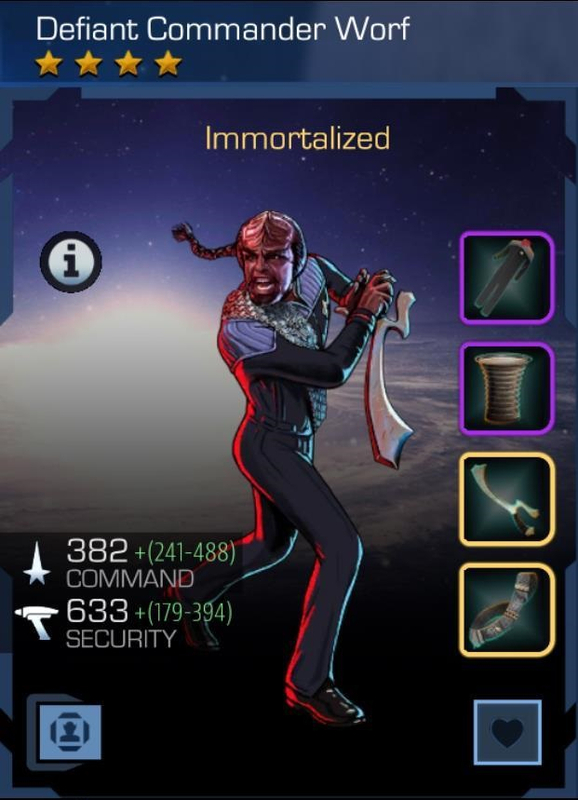 DC Worf was the 4* daily reward from May-Aug 2016 so I only got the last one. 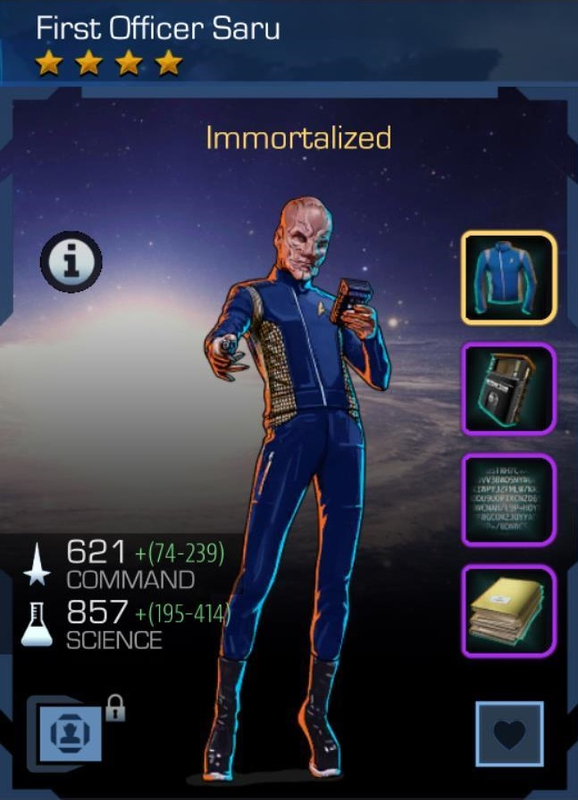 And he sat in my crew at 1/4 for almost a year when I finally picked up a second one when I did a bunch of premium portal pulls this past July. Then nothing for another 3 months until the last 2 came from recent voyages. He's finally ding-dang-done! Nice work Eljay. I'm still searching for stars for mine, do you have anyone special lined up for #200? I don't seem to be able to insert pictures anymore. I get an orange banner at the top of the post saying "You have to be around for a little while longer before you can post links". I will try again tomorrow. Another from the line of airlock fodder that never seemed to come together at one time until - voyages. Now out you go again.